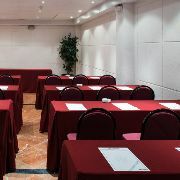 Catalonia Hotels offers a special discount of 5% in all of our hotels in Barcelona to Rare Cancer Network Meeting from 17 to 20 May 2018. 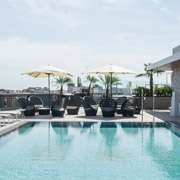 *Select a hotel, and you will automatically be given the discount when you select a room. 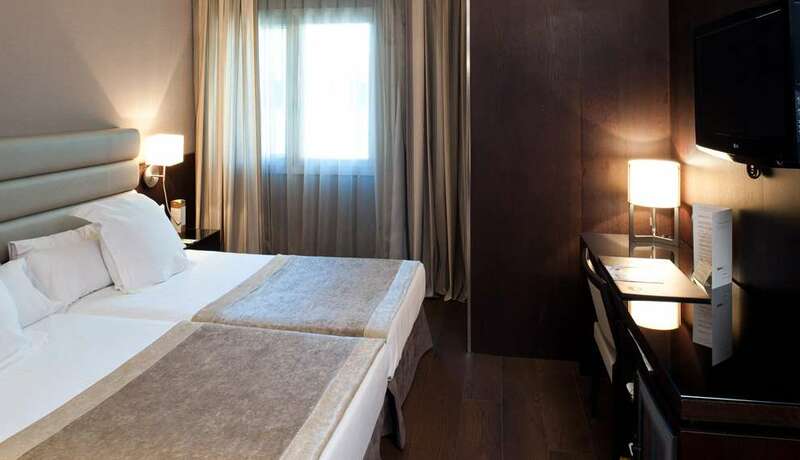 You’ll feel right at home at the Catalonia Albéniz whether you are travelling for leisure or business. 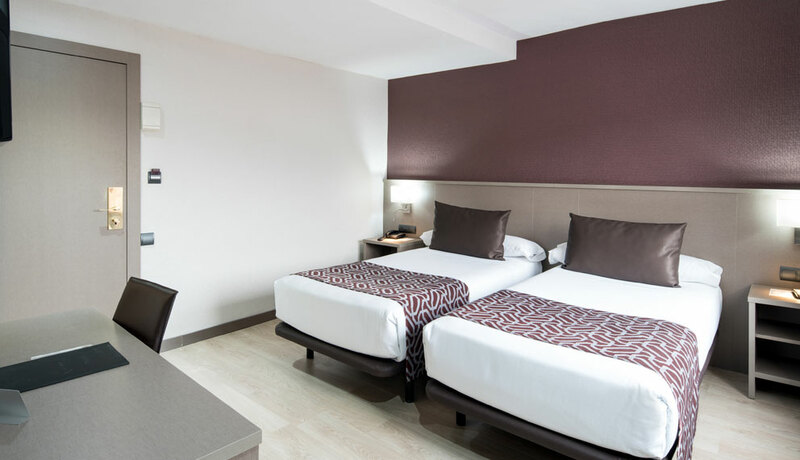 Close by you have transport into the centre of Barcelona which will whisk you directly into the cultural and shopping area (Passeig de Gràcia). 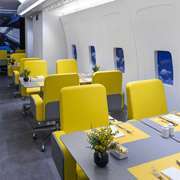 It will also take you to Barcelona Airport. 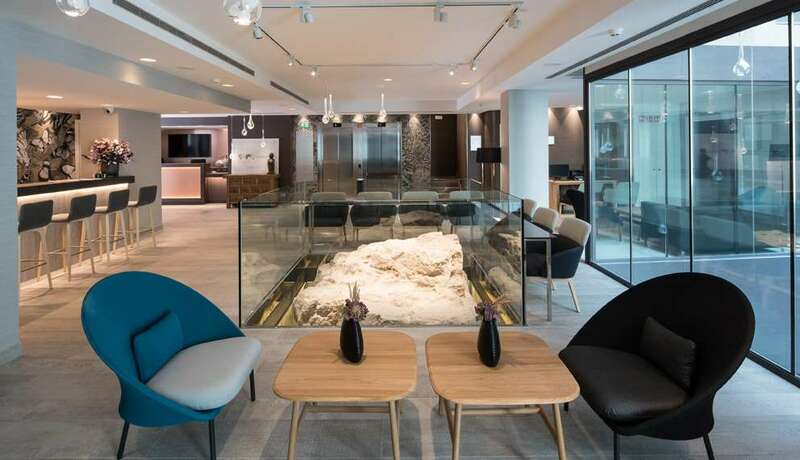 The district that is home to the Catalonia Albéniz blends a strong economic potential with large tech firms based in the business zone and more traditional local stores, in addition to a wealth of activities to do. It runs from the middle of the city down to the sea, which you can reach on foot. 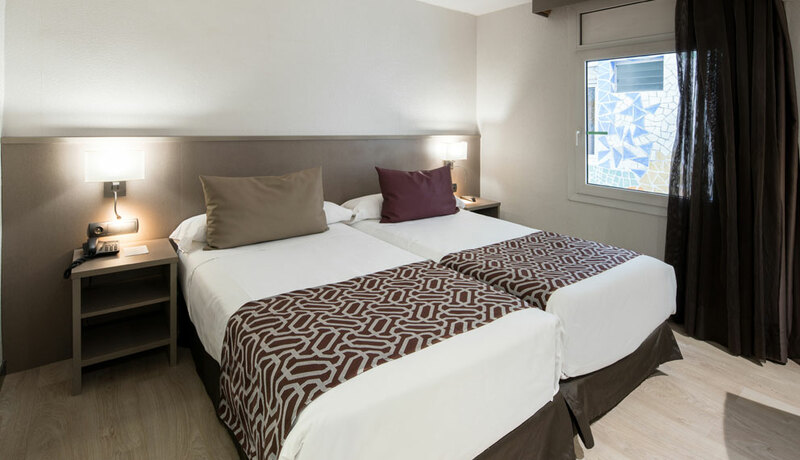 Sant Martí is a very lively neighbourhood with a shopping centre and traditional local businesses, bars with a great deal of charm, music venues and strolls to the sea. Also close by is Gaudí's Sagrada Familia, where you can enjoy modernist architecture, and the Hospital de Sant Pau modernist complex. 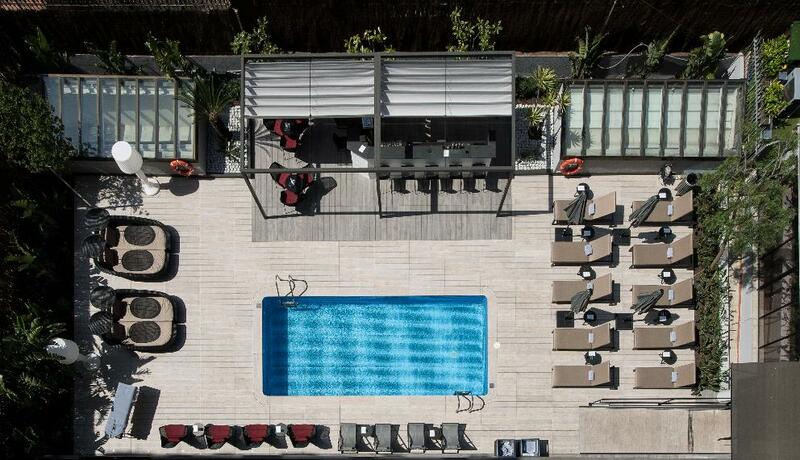 The Catalonia Albéniz boasts large rooms with free wifi beside the pool for a dip and a break from the hustle and bustle of the beautiful cosmopolitan city of Barcelona. 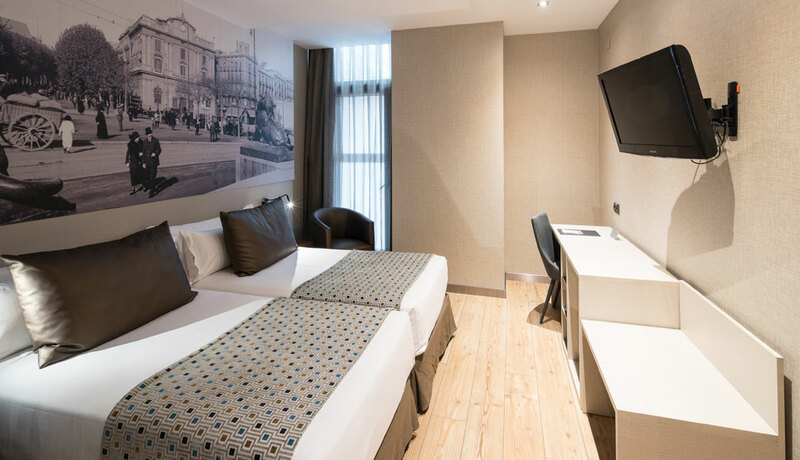 From the hotel you can walk to the Les Glòries shopping centre which boasts famous clothes, tech and food brands, or check out the Els Encants market for second-hand clothing and ornaments. 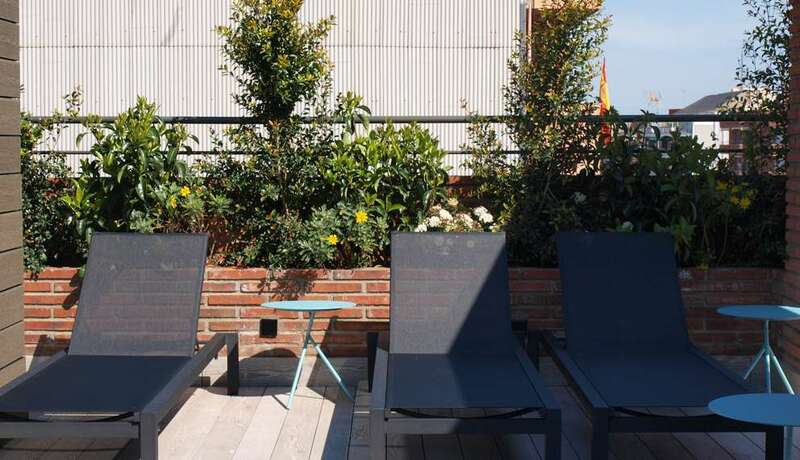 You can also browse the on-trend street markets of the nearby neighbourhood of Poblenou, where you will find a wealth of ideas at Lost & Found, the Flea Market, Fleadonia, Palo Alto Market or Two Market. If live music is your thing, very close by, at Fórum Parc in Sant Martí, there are fantastic concerts like Primavera Sound and Cruilla...buy your tickets in advance! 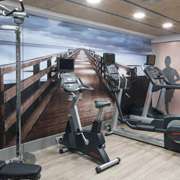 In the afternoon you can hire skates or bicycles along Passeig Marítim in Barcelona’s Olympic Port area or enjoy the sunset with a good ice cream. 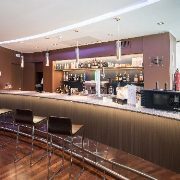 If you fancy a flutter, check out Barcelona Casino, located in a very busy area with lots of places for going out. 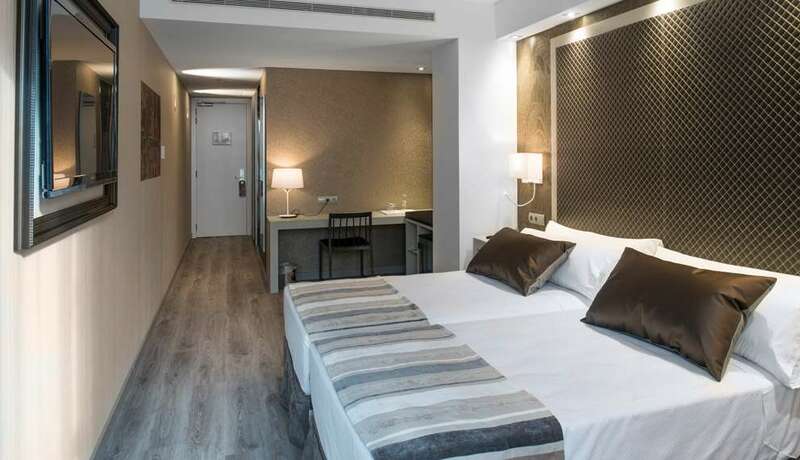 All the rooms at the Catalonia Atenas have free wifi and are soundproof. 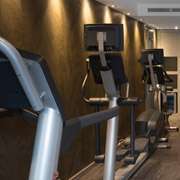 They feature air-conditioning and heating, a minibar (on request), a safe, a phone and a television, a shower or bathtub and a hair dryer. 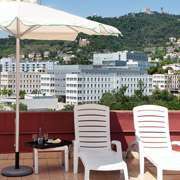 In the vicinity of the Catalonia Atenas and very close by on foot you can visit the Sagrada Familia and the modernist Recinte Sant Pau (formerly a hospital). 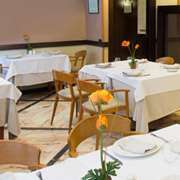 The Les Glòries shopping centre is a 15-minute walk away. 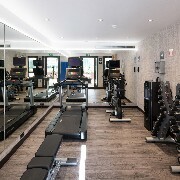 However, if you prefer spending more time in the hotel you can enjoy a dip in the pool on the terrace that has stunning views or relax in the spa, the welcoming water zone and wellness space designed to achieve maximum relaxation, or keep in shape at the gym and practice sport in the hotel itself. 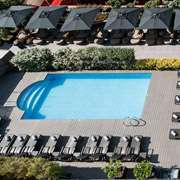 There is a wealth of activities to enjoy around the Hotel Catalonia Atenas. 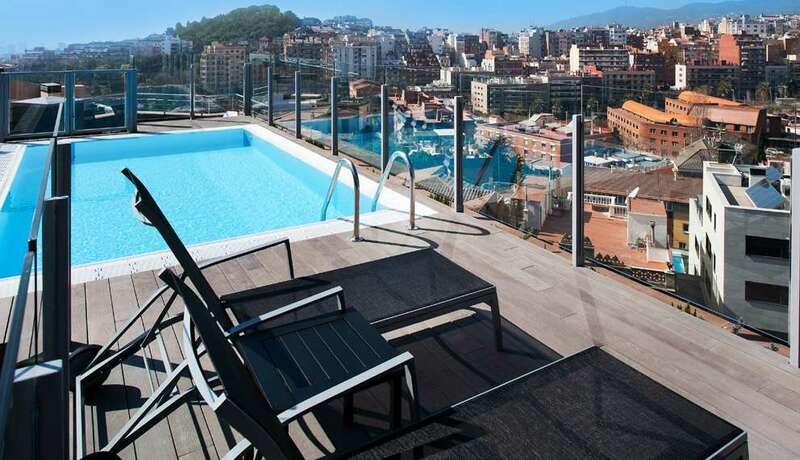 Sant Martí is a very lively neighbourhood with a shopping centre and traditional local businesses, bars with a great deal of charm, music venues and strolls to the sea. Also close by is Gaudí's Sagrada Familia, where you can enjoy modernist architecture, and the Hospital de Sant Pau modernist complex. If live music is your thing, very close by, at Fórum Parc in Sant Martí, there are fantastic concerts like Primavera Sound and Cruilla...buy your tickets in advance! 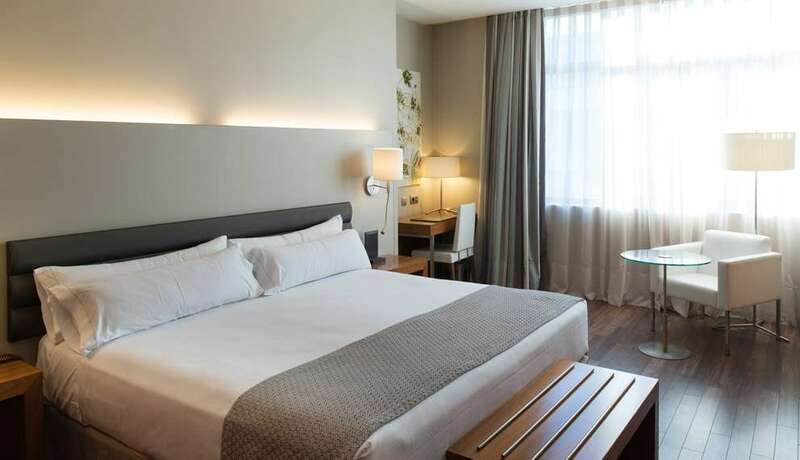 From the hotel you can walk to the Les Glòries shopping centre which boasts famous clothes, tech and food brands, or check out the Els Encants market for second-hand clothing and ornaments. You can also browse the on-trend street markets of the neighbourhood of Poblenou, where you will find a wealth of ideas at Lost & Found, the Flea Market, Fleadonia, Palo Alto Market or Two Market. In the afternoon you can stroll along Passeig Marítim in Barcelona’s Olympic Port area, enjoying the sunset with a good ice cream. 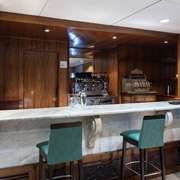 Or if you want to visit Barcelona Casino, it’s next to Passeig Marítim in an area packed with good restaurants and night spots. 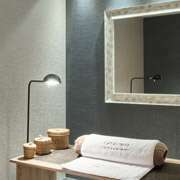 The modern, minimalist design of each room in this hotel will take you to another world and offer the possibility of disconnecting from the city's hustle and bustle for a few hours. 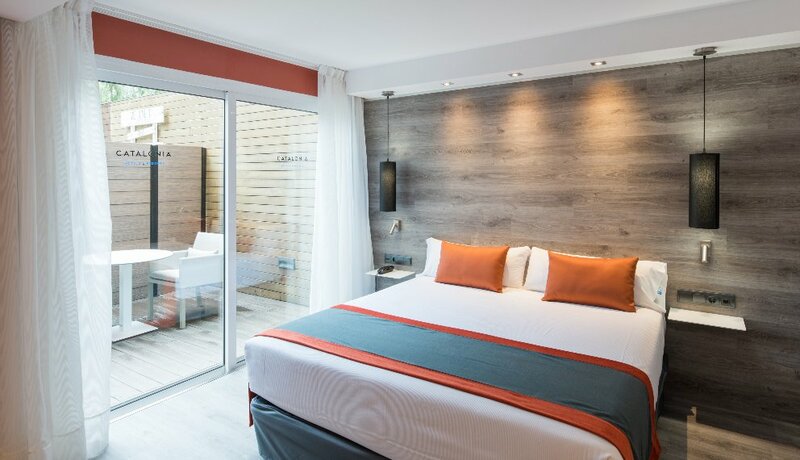 The Catalonia Avinyó hotel has been designed from a sober, functional and simple viewpoint that invites guests to relax and enjoy the peace and quiet. 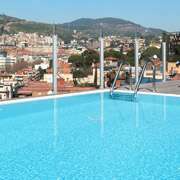 You can take a deserved rest in the solarium, which has a swimming pool and Jacuzzi on the panoramic terrace, where you can enjoy a new, unforgettable view of the light and colour of this Mediterranean city. 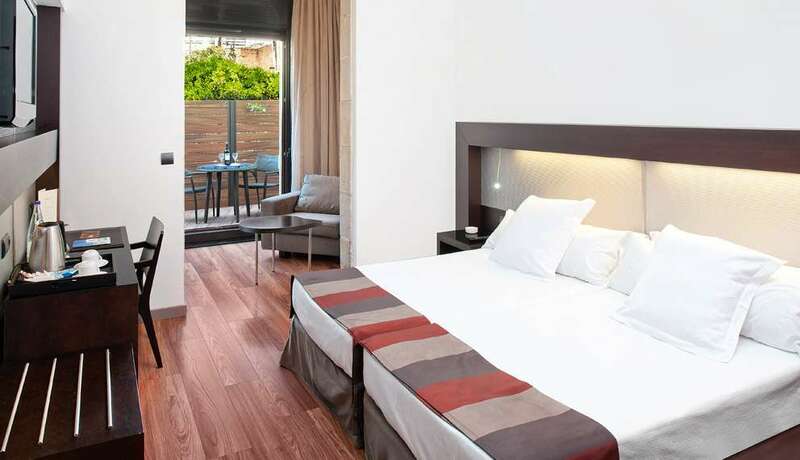 The hotel Catalonia Avinyó is surrounded by some of the city's most beautiful places, next to the avant-garde, Bohemian quarter of El Born, where you can enjoy the busy atmosphere, the best tapas and the most exclusive boutiques in a picturesque mediaeval setting. 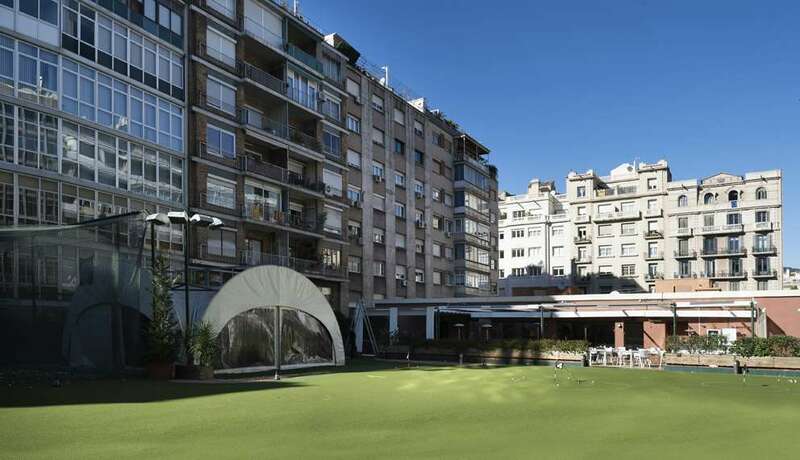 The Catalonia Golf hotel is adjacent to the Eixample Esquerra and Gràcia neighbourhoods. 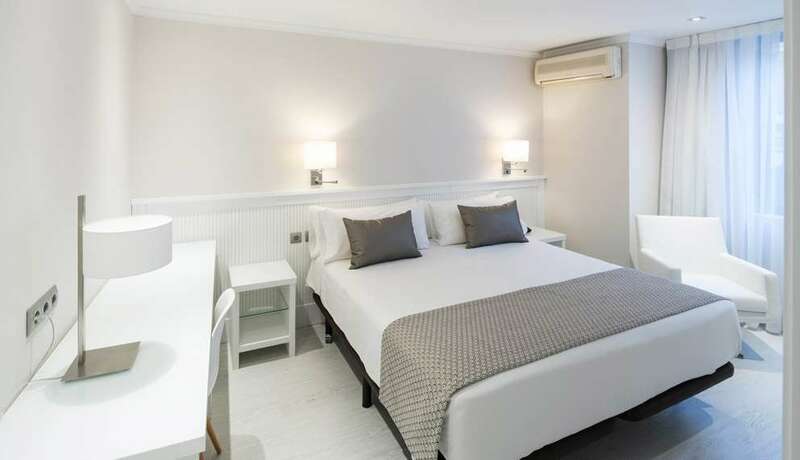 Avinguda Diagonal, with its shops, restaurants and wide footpaths to stroll along and take in the surrounding beauty, is just a few streets down from the hotel. 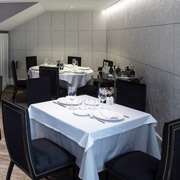 The neighbourhood of Sarrià-Sant Gervasi and this hotel are a great choice for visitors who are fans of architecture, exclusive high-end stores and restaurants with signature market cuisine The hotel enjoys a good location in a quiet area away from the stress of the centre but just a few minutes from the downtown zone. You can even get there on foot! 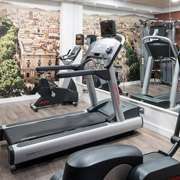 The hotel is less than a five-minute walk from the Gràcia train station and 10 minutes from the Diagonal metro stop which takes you straight to Plaça de Catalunya and the famous Rambles, the premier tourist hub. 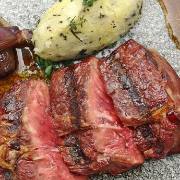 An extensive and diverse variety awaits you as soon as you step out of the hotel: excellent restaurants and bars, shops of all sorts, parks to enjoy and two delicious food markets beside the hotel: Llibertat and Sant Gervasi, with quality local produce. 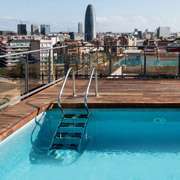 Tell us about your holidays or business trip in Barcelona. We want to hear from you! Formerly Catalonia Princesa. 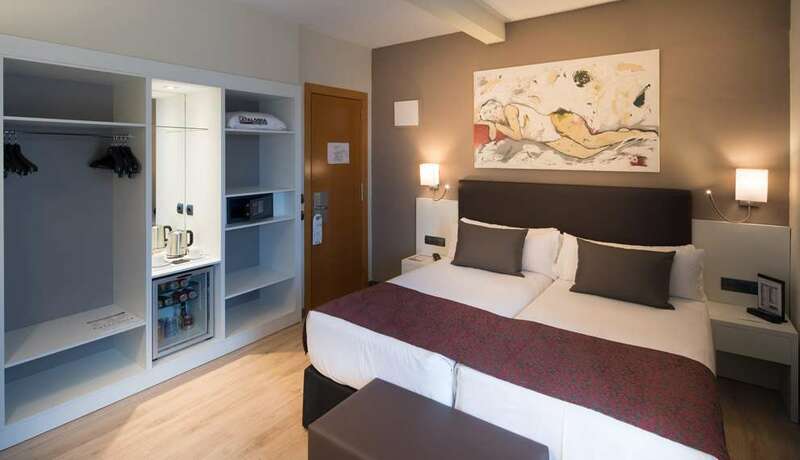 This modern hotel is located next to Barcelona's Arco de Triunfo and Ciutadella Park in the historical and commercial centre of the city, near to Plaza Cataluña and the Gothic quarter. 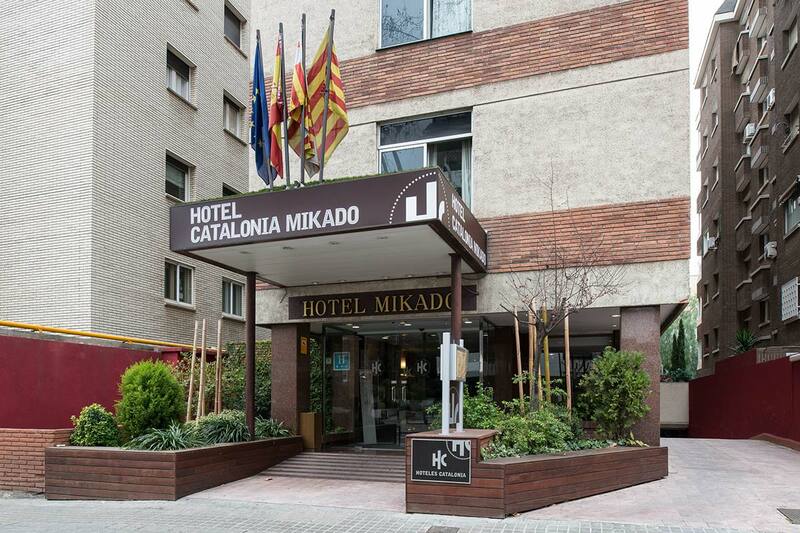 The hotel is set in a building characteristic of the beginning of the textile industry era of Catalonia. 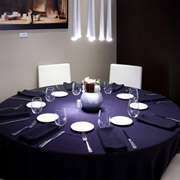 Previously, it consisted of a stately building that was used as a home by the business owner and his family. 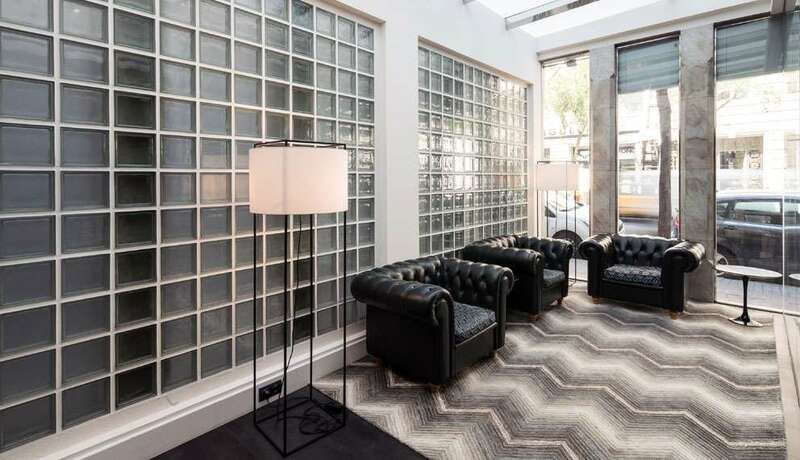 The rest comprised a number of buildings situated around a central courtyard, the function of which was to provide light and ventilation for the various plants that worked with the steam machines that operated the weaves. 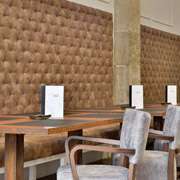 The building was refurbished with the greatest respect for its original features. 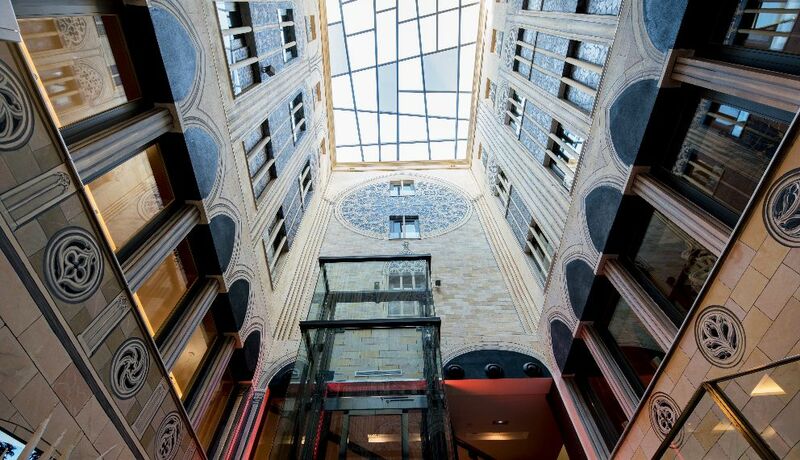 One of the most characteristic areas of the hotel is the central courtyard, which is decorated in warm colours and is open to a large quantity of natural light. 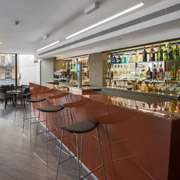 The skylight closes the courtyard off but lets a great amount of light through to every communal area: the restaurant, bar and lounge. 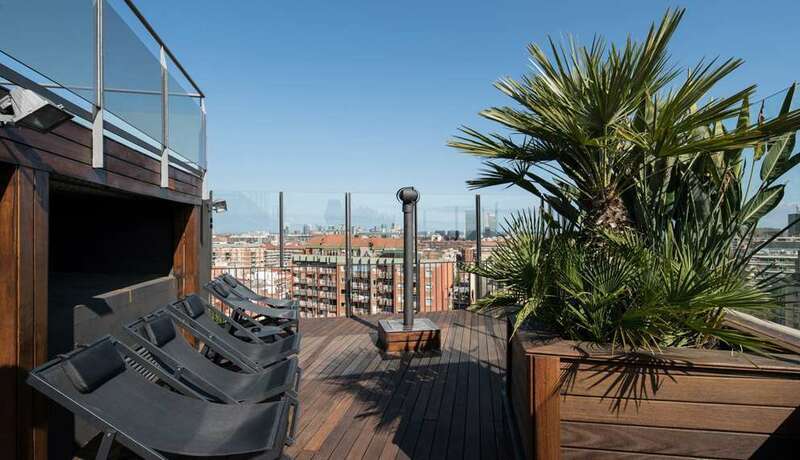 The balconies maintain the appearance of the period in which the building was constructed, and are finished in fine Catalan stoneware in which all the pieces are of the same quality and colour. 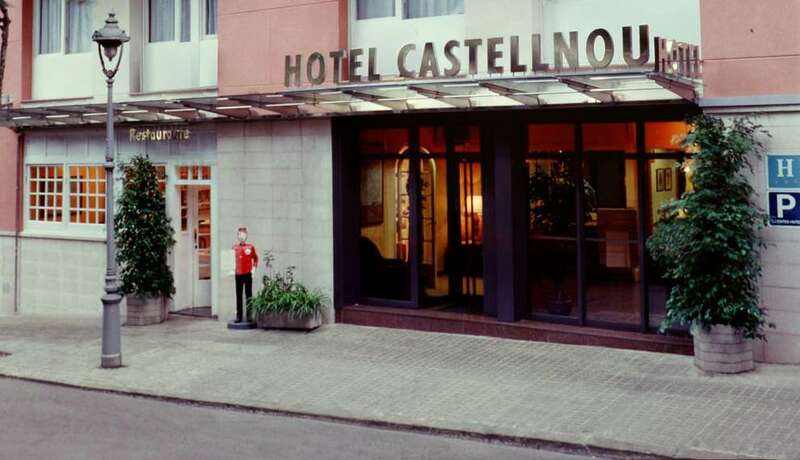 The Catalonia Castellnou hotel is located in the district of Sarrià-Sant Gervasi, one of the most upscale and peaceful residential areas, close to the centre of the city and just a few metres from the Tres Torres metro station. 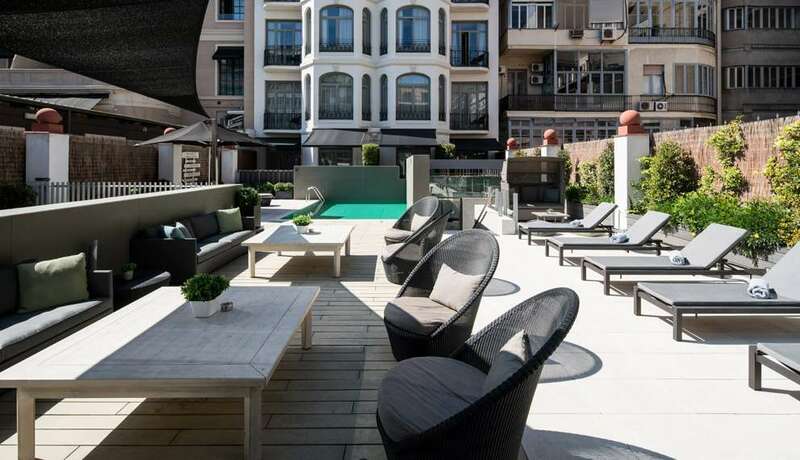 It is a neighbourhood with bags of charm, preserving the beauty of the old centre with its traditional stores and businesses in an exquisite residential neighbourhood where the bourgeoisie built their large, modernist homes. 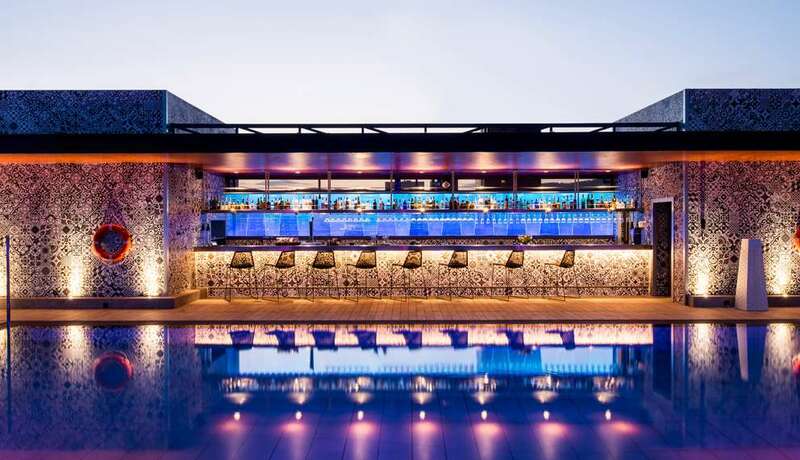 It also has a great vibe, high-end restaurants and fantastic bars where you can enjoy fine Mediterranean cuisine while taking in the sun of the city of Barcelona. 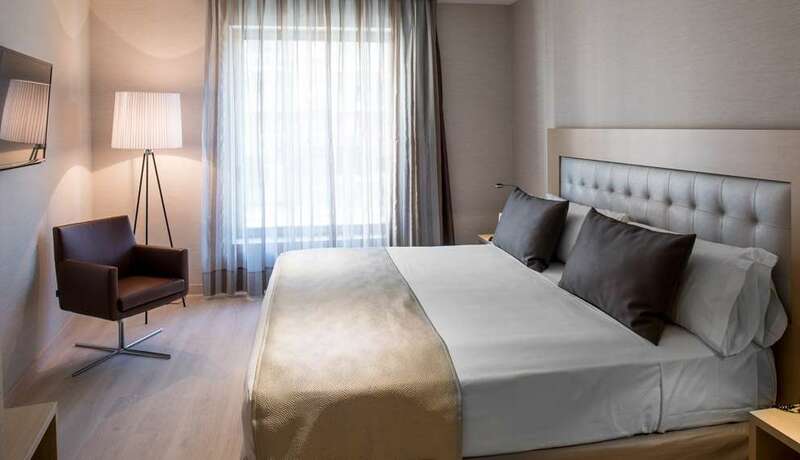 A 15-minute walk away is Avinguda Diagonal, one of the most important streets in the city, and the Pedralbes Centre mall right next door to the El Corte Inglés department store. 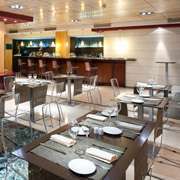 Around the Catalonia Castellnou there’s a wealth of Mediterranean restaurants for lunch or dinner. 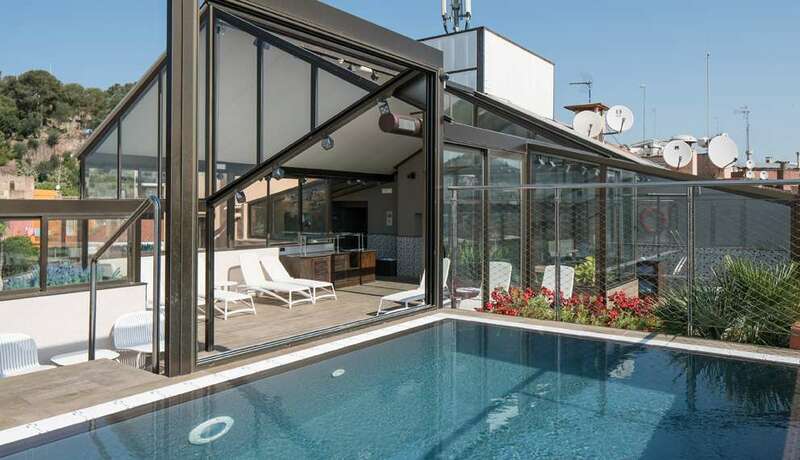 It is also one of the most chic neighbourhoods of Barcelona, with beautiful modernist homes that you can’t afford to miss if you’re a fan of culture and architecture. The IVI, Corachán and Fertilab clinics are also close by. 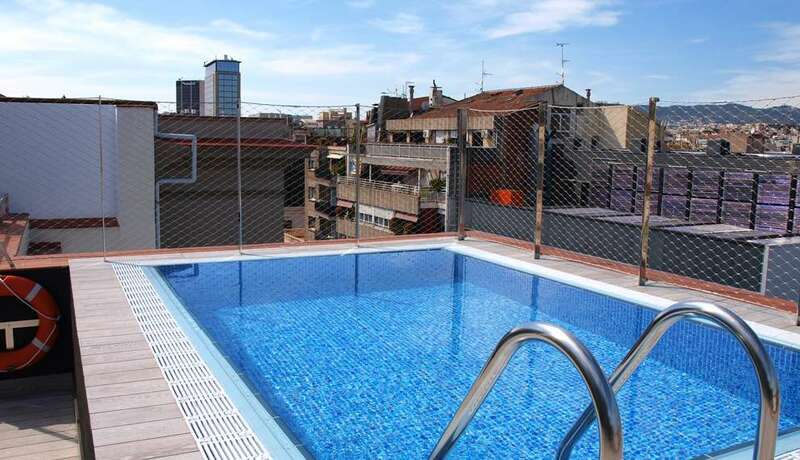 It is just 250 metres from the Tres Torres metro station and 15 minutes by train from downtown Barcelona. The F.C. 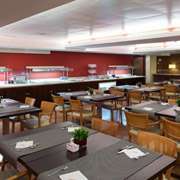 Barcelona football stadium is less than 2 km away - highly recommended if you’re a football fan. 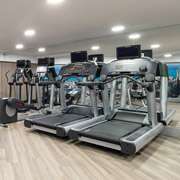 And, just 10 minutes on foot is Avinguda Diagonal, one of the main streets in the city, where there is an El Corte Inglés department store and a further two shopping centres: L'Illa Diagonal and Pedralbes Centre. 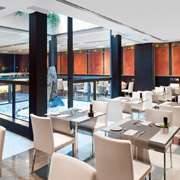 If you enjoy traveling, at the hotel Catalonia four star Gran Via BCN you can do so without stepping outside of the hotel. 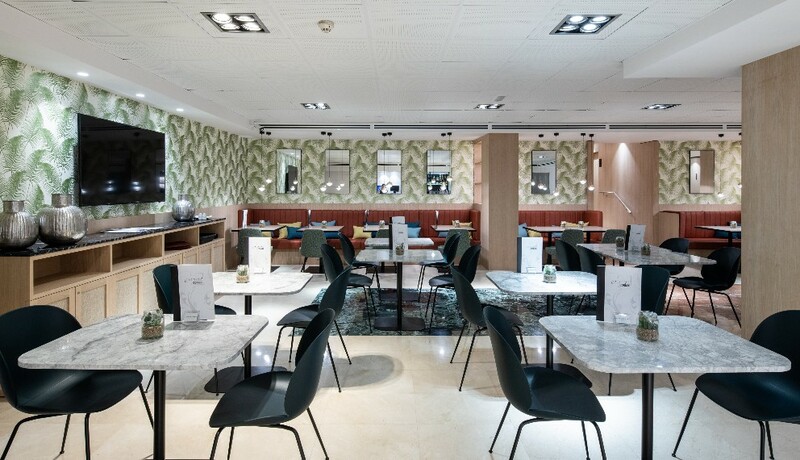 For example, you can get your boarding card, have breakfast in the area called "La Terminal" and savour the delicious food in the restaurant Gourmet A-320. 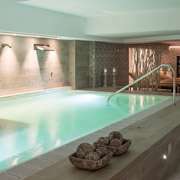 And it doesn't stop there; each of the 63 rooms will take you to a different destination, from London to Santorini, to Casablanca and Paris. 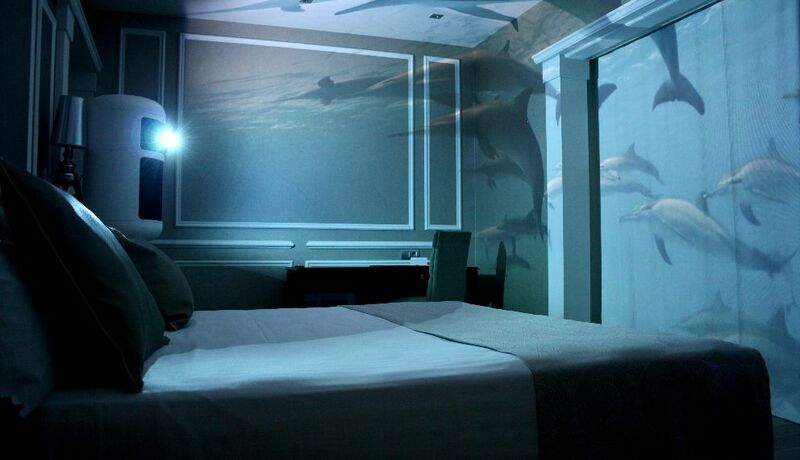 This surprise will be unveiled when you open the door to your room. 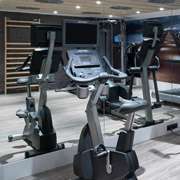 You can then slip into your bathing costume and relax by the pool, or you could go down to the gym to tone up your muscles. 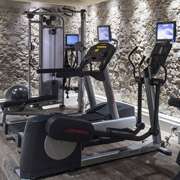 It goes without saying that there is a Wi-Fi connection throughout the hotel. 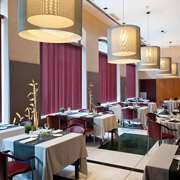 Once out of the hotel Catalonia Gran Via BCN , you will find yourself in the middle of Barcelona. 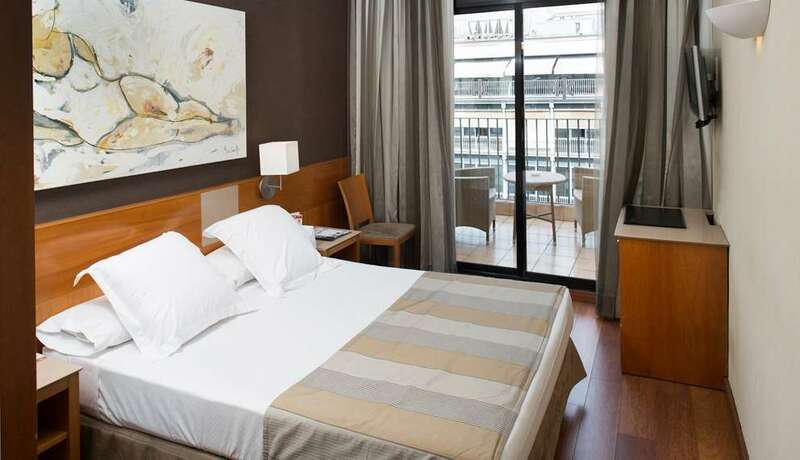 You can take a walk along Gran Vía as far as Plaza Cataluña, Las Ramblas and the Gothic quarter. 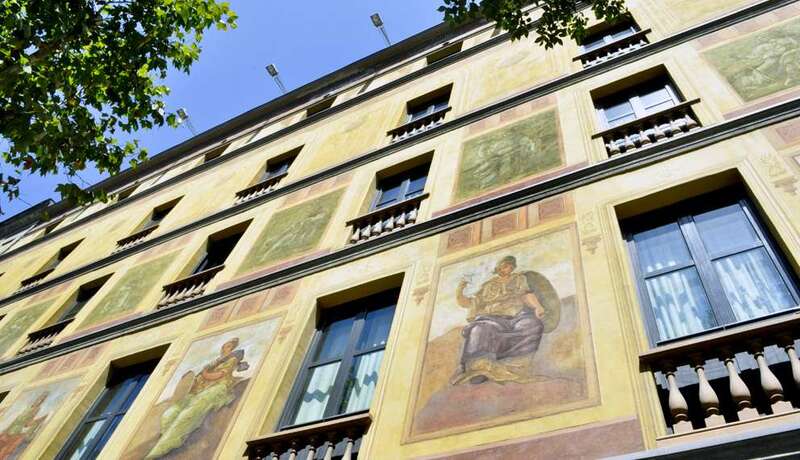 The beautiful street of Paseo de Gracia is not to be missed with some of Barcelona's most exclusive stores, as well as some of the most emblematic buildings of Catalan Modernism. 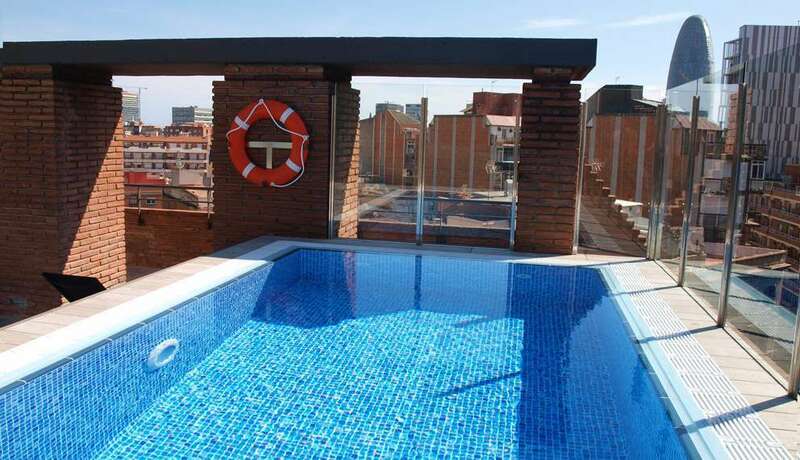 It is also close to Plaza España, the "magic fountain" of Montjuïc and the trade fair centre. 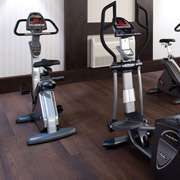 What’s more, the hotel has very good transport links with the rest of the city. 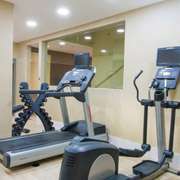 There are bus and underground stops just a few steps away. If you need to take a high speed train or a local train service, Sants railway station is easy to get to using public transport. If you're going to the airport, the shuttle bus will take you to terminals T-1 and T-2... and the bus stop is right next to the hotel! Formerly Catalonia Córcega. 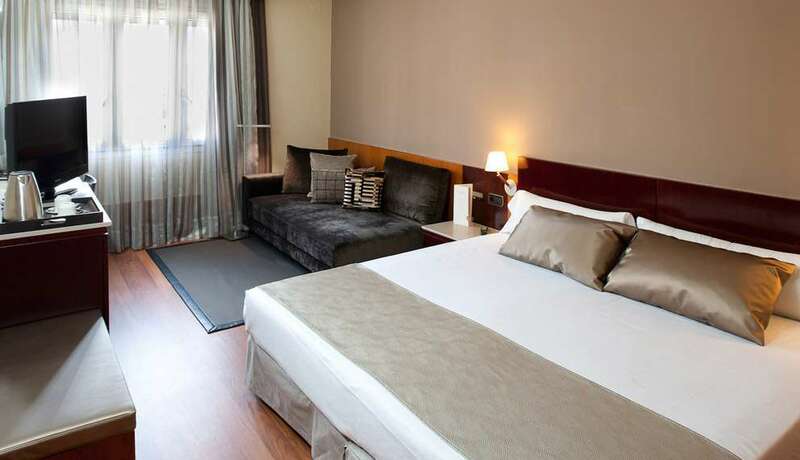 This hotel is located near Paseo de Gracia and Plaza Catalunya, a few metres from La Sagrada Familia and offers ideal accommodation for city breaks. 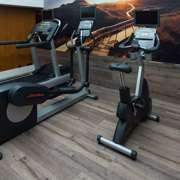 Its location and features will let you enjoy the busiest area of the city and the hustle and bustle of the commercial area. 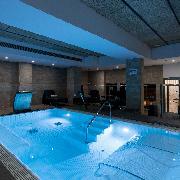 At the same time, you can enjoy deserved moments of peace and quiet and relaxation. 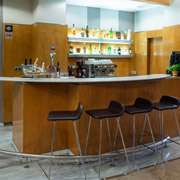 It is also situated next to one of the city's main tourist offices, Palau Robert, where you will find all the information you need to enjoy everything that is happening in Barcelona. 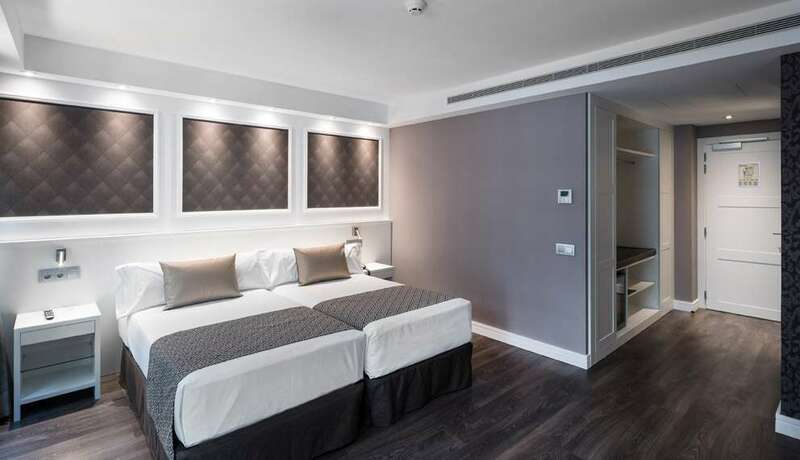 New four-star hotel located in the heart of Barcelona, Catalonia Magdalenes hotel tucked between the Portal de l'Angel and Via Laietana shopping streets in the city’s Gothic Quarter and steps from Las Ramblas, Plaza Catalunya and the Cathedral. 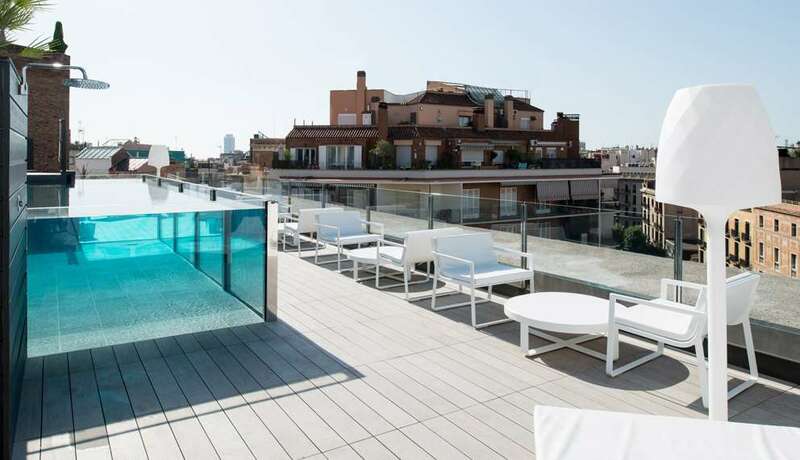 Its exceptional location makes it easy for guests to visit Barcelona’s top tourist attractions and discover its full range of shopping options and the contrast between its most traditional and luxurious stores. 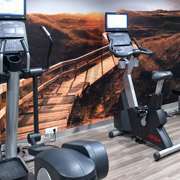 This hotel with a Gothic Quarter flavour is located on a street that forms part of Barcelona’s Roman past, home to many still undiscovered ruins, and the hotel lobby safeguards and exhibits three sections of a Roman aqueduct. 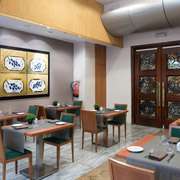 Tastefully decorated, the hotel aims to enhance guest comfort in a stylish and cosmopolitan atmosphere. 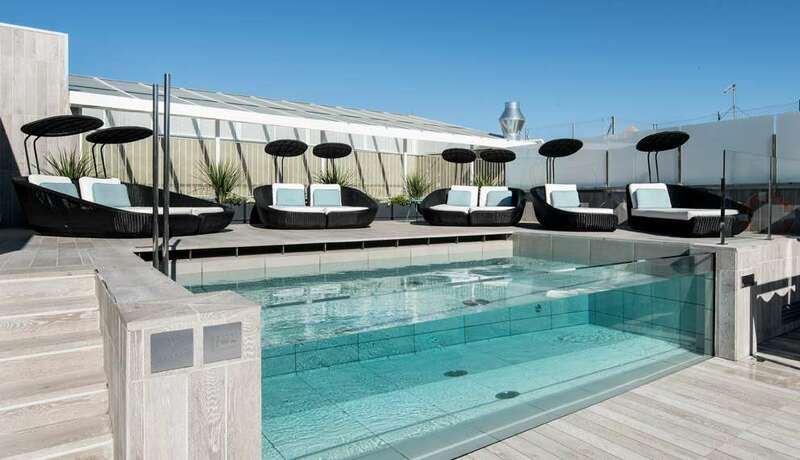 A quiet oasis away from the bustle of the city, where guests can choose to relax in the hotel spa with hammam and massages or enjoy the view over the centre of Barcelona on the magnificent rooftop terrace with a glass-enclosed pool, sun deck and snack bar in summer. 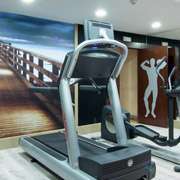 The Catalonia Magdalenes hotel also offers a fitness room. 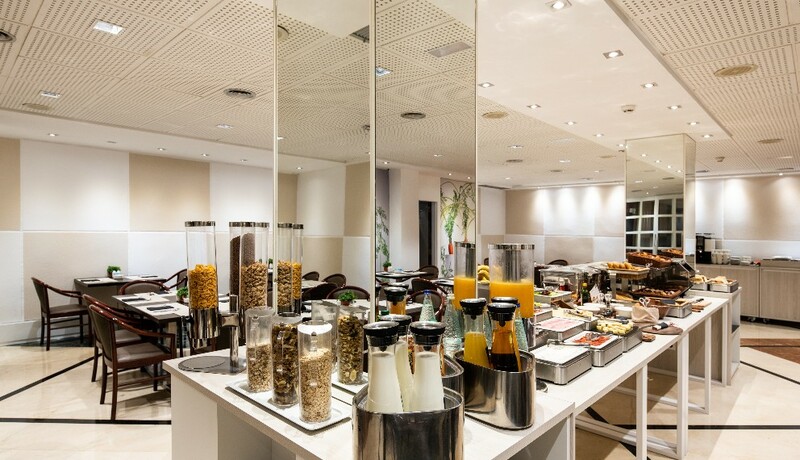 Complete and varied breakfast buffet with chef stations, lobby bar and terrace bar open during the summer months. 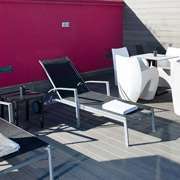 Internet corner and free Wi-Fi throughout the hotel. 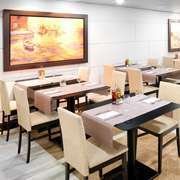 61 practical and comfortable rooms with all the amenities. 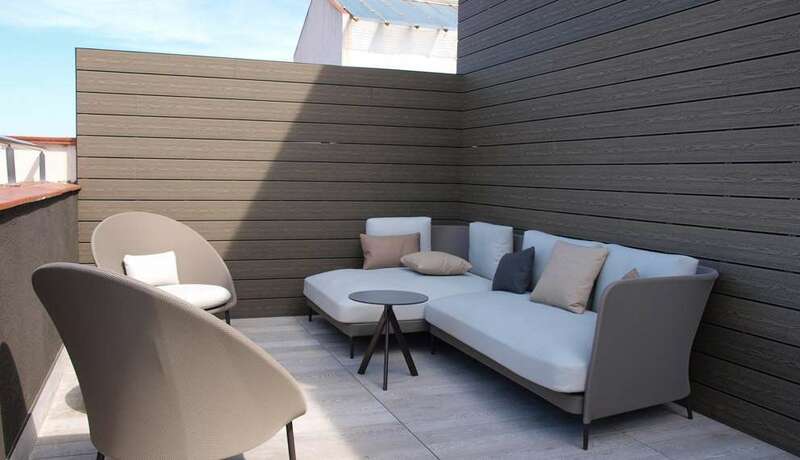 Our interior gardened courtyard has an area of approximately 100 m² and has been fully renovated and converted into a pleasant, modern bar terrace with a warm design in wood. 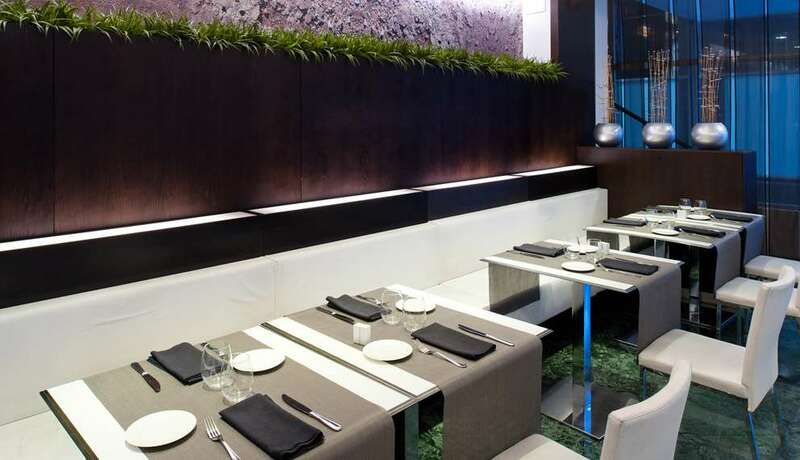 It is open throughout the day for moments of peace and quiet in the upper area of Barcelona. 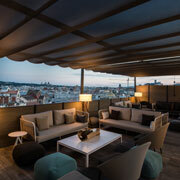 Enjoy this pleasant location at breakfast or for an aperitif. And if you prefer to enjoy the most fabulous views of the city, you can organise an unforgettable excursion and ride the mythical Blue Tramway, which will take you to the Tibidabo attraction park. 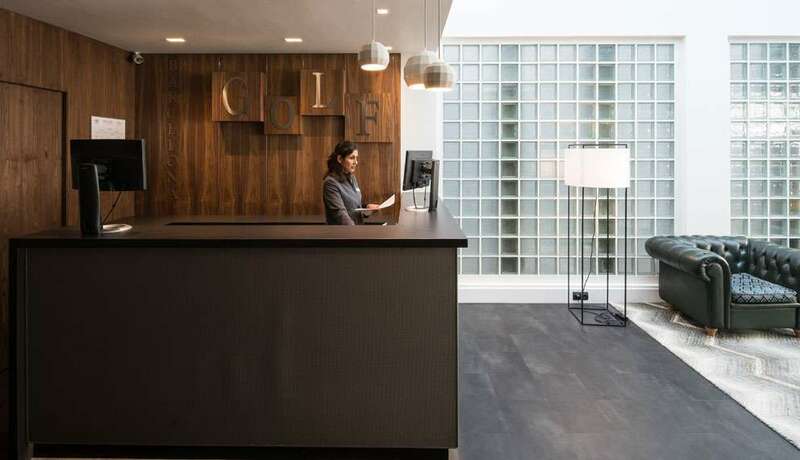 Our hotel is situated near prestigious medical centres such as Teknon, IMO, Institut Català de la Retina (ICR) and the Official Charter of Physicians. 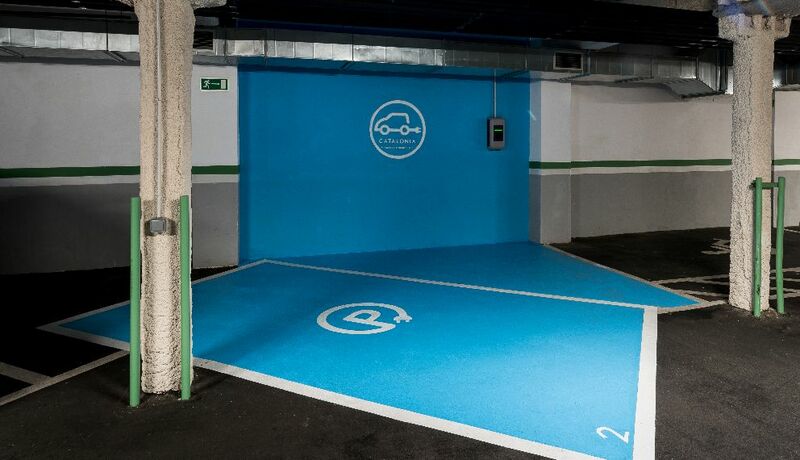 It is also very close to university centres such as Institut Químic de Sarrià, Universitat Internacional de Catalunya and Universitat URL-La Salle. 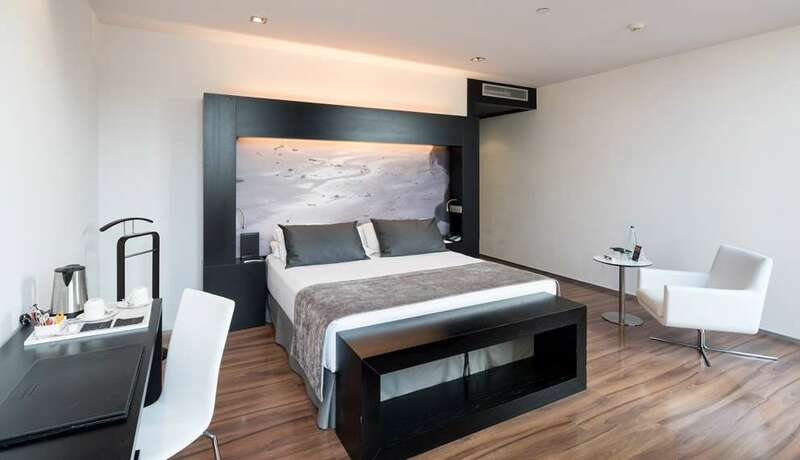 The Catalonia Park Güell is just a few metres from the Vallcarca metro station, which connects with the centre of the city and will whisk you into Plaça de Catalunya in 10 minutes. 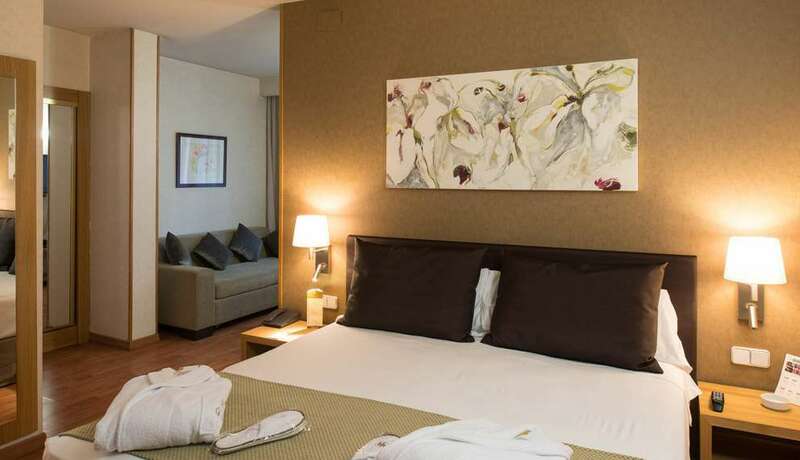 The hotel is very close to the internationally renowned tourist attraction of Park Güell. Opened in 1926, you would never think that this beautiful park was designed and built so long ago by the most famous Catalan modernist architect, Antoni Gaudí. The beautiful modernist park, where you can easily spend a whole day, was listed as a World Heritage site in 1984. 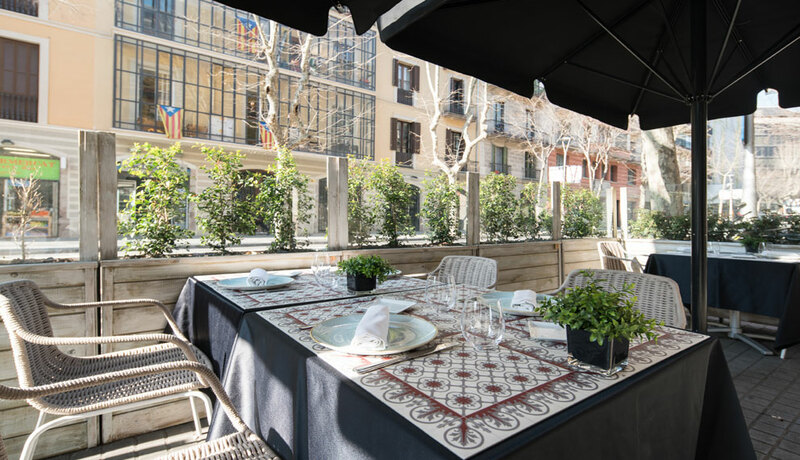 The well-known Gràcia neighbourhood is also nearby and is one of the liveliest in Barcelona, with squares packed with bars and restaurants featuring all sorts of food. Grab a seat because they fill up fast! 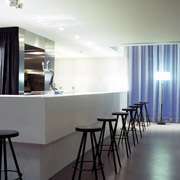 Plus there is the Verdi cinema showing independent films, and lots of quirky local stores. 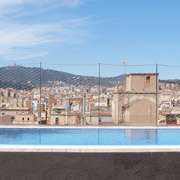 Although located in the heart of Barcelona it conserves the essence of the former village of Gràcia with its street festivals. 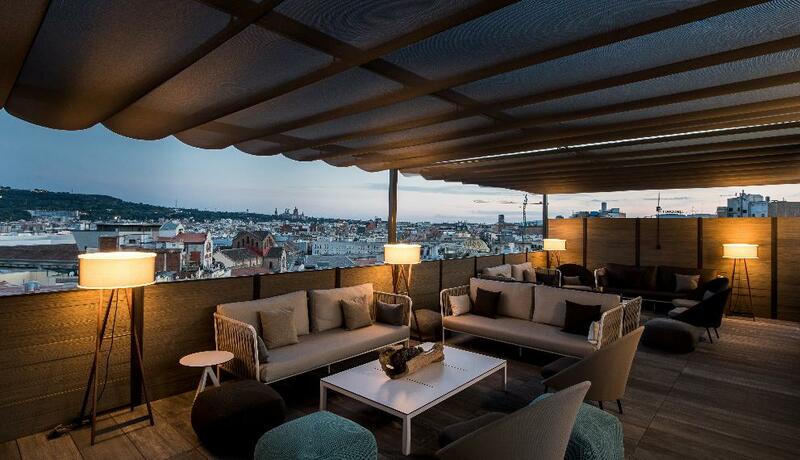 Because the hotel is close to Turó del Carmel hill, you shouldn’t miss the chance to experience seeing Barcelona from on high. 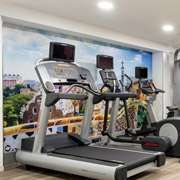 Staying at the Catalonia Park Güell is a good way to enjoy the wonderful city of Barcelona with its many places to discover. 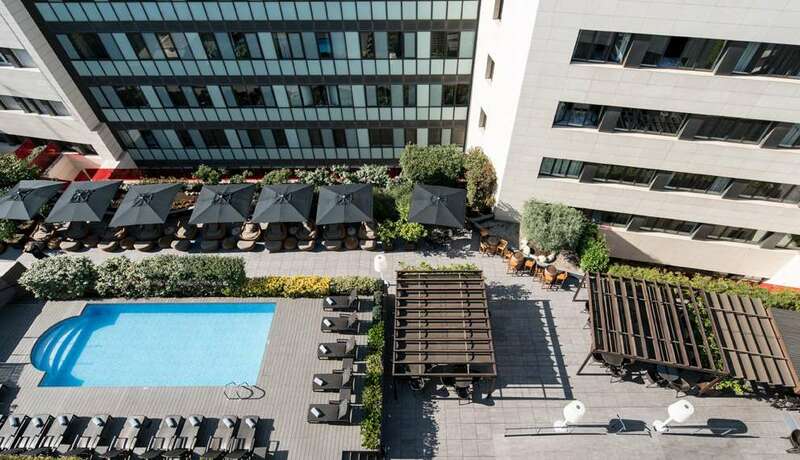 The Catalonia Passeig de Gràcia hotel is located on a beautiful classic building of the beginning of the 20th century and has an outdoor pool with terrace with a calm garden area and its own parking facilites. 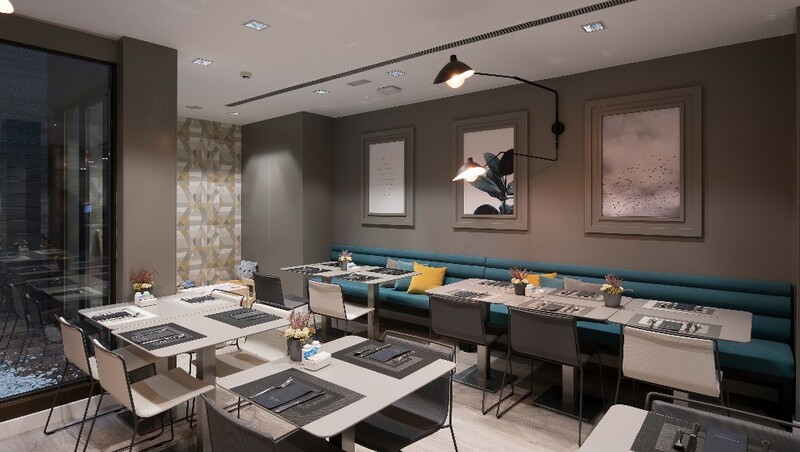 Taste the best 'tapas' at the hotel's gastrobar and enjoy the best dishes of Catalan cuisine at its restaurant. 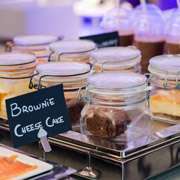 You can't also miss the amazing breakfast, with a deluxe buffet and show cooking! 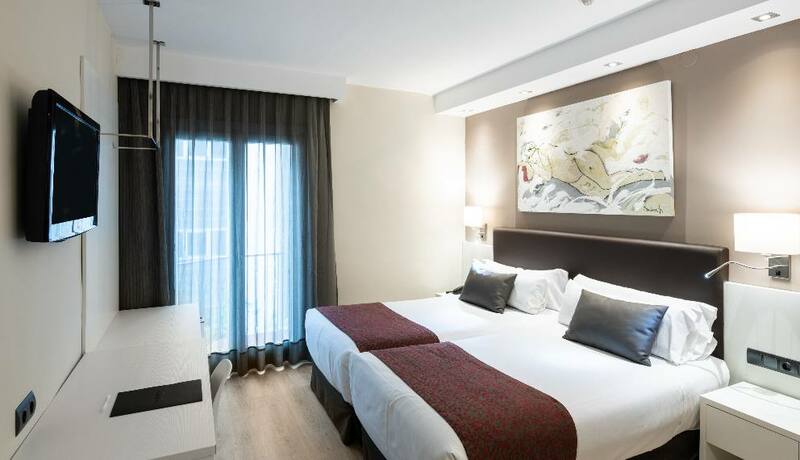 Catalonia Passeig de Gràcia hotel has 74 rooms with a contemporary décor, fully equipped with free-use smartphone Handy, free Wi-Fi connection and safe deposit. 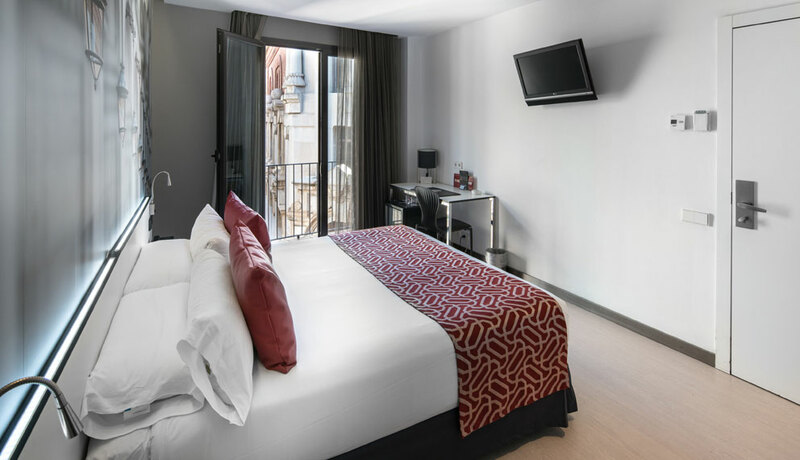 Set opposite the Basilica of La Mercè, next to the eclectic, Bohemian quarter of El Born, Catalonia Port hotel is situated in a magical setting. It is an 18th-century building and has also been designated one of the city's artistic heritage sites. 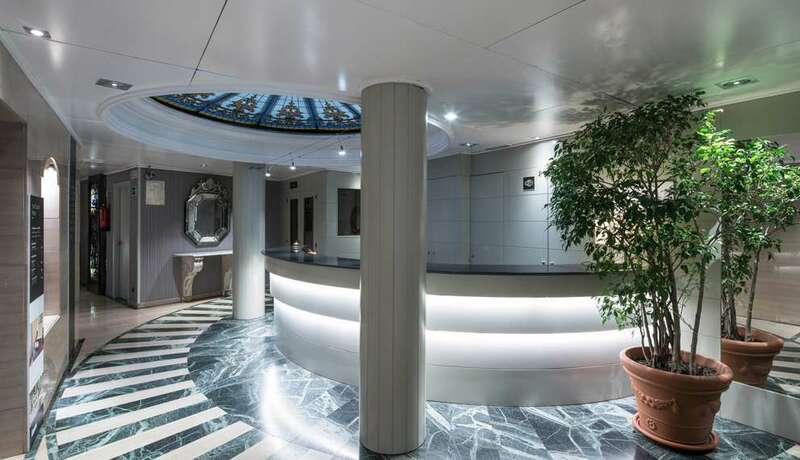 Fully refurbished, it opened in July 2008 and offers a perfect combination between classicism and innovation. 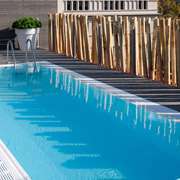 Enjoy the sunny days of Barcelona in the swimming pool, which is situated in the hotel's charming garden and patio. 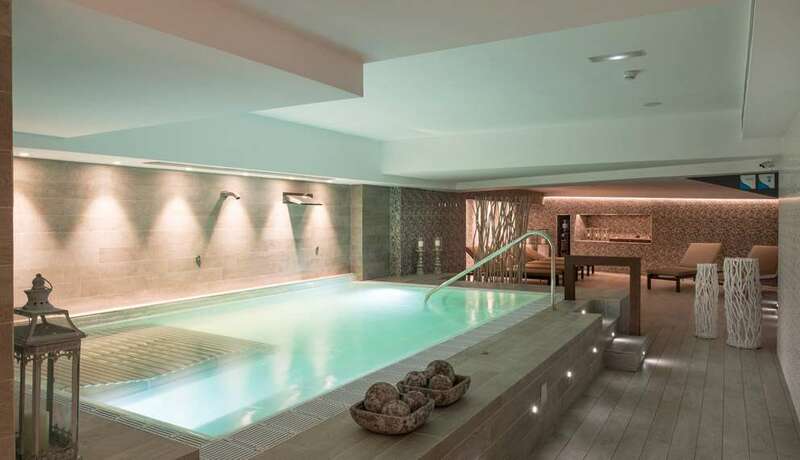 All our guests will also be able to use the spa in one of our chain's hotels: Hotel Catalonia Ramblas, which is located very near to the Catalonia Port hotel. 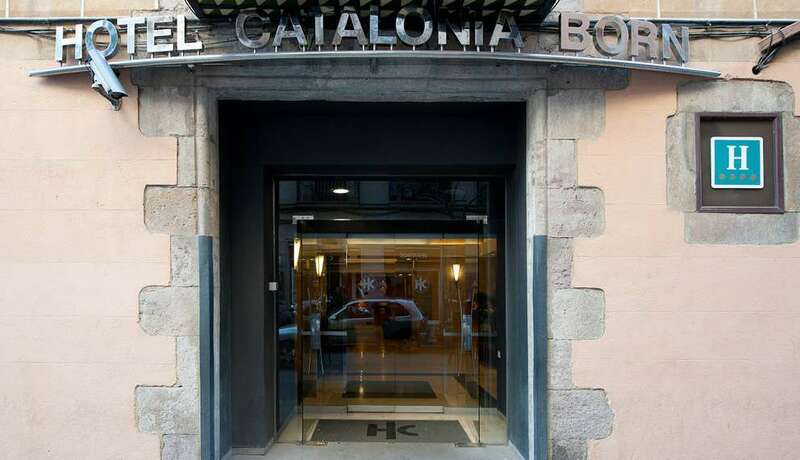 The fabulous hotel Catalonia Portal de l'Àngel is situated on Portal de l'Àngel, a large pedestrian shopping street in the city centre, a few metres from Plaza Cataluña and the Cathedral. 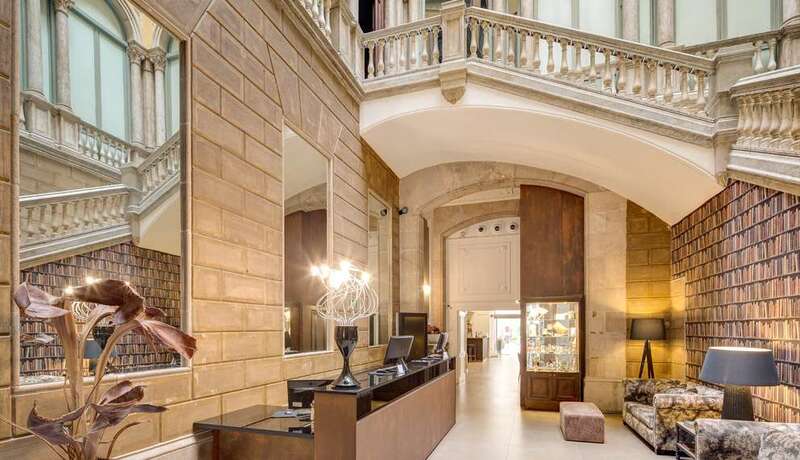 The current hotel building is a former palace from the 19th century, listed as a building of historical and artistic interest. It was built in 1872 by the Master Builder Pedro Bassegoda i Mateu (1817 – 1908) and, since then, the neoclassical facade has been kept intact, with its austerity and Baroque and Romanesque motifs. The width of the surprising entrance was designed for the carriages to pass through at the beginning of the 19th Century. 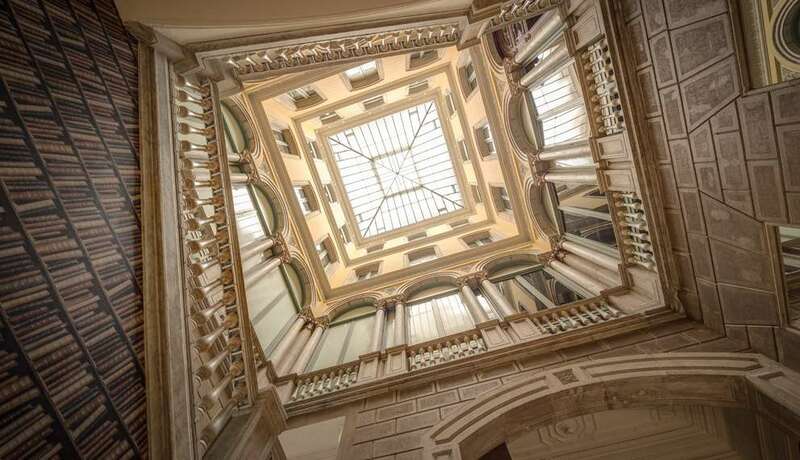 It leads to the interior courtyard of the building, which has been refurbished in accordance with the original design and contains a spectacular marble staircase typical of the stately homes of the period. Continuing along the corridor, it leads to El Jardí de l’Àngel, where it is easy to disconnect from life outside. 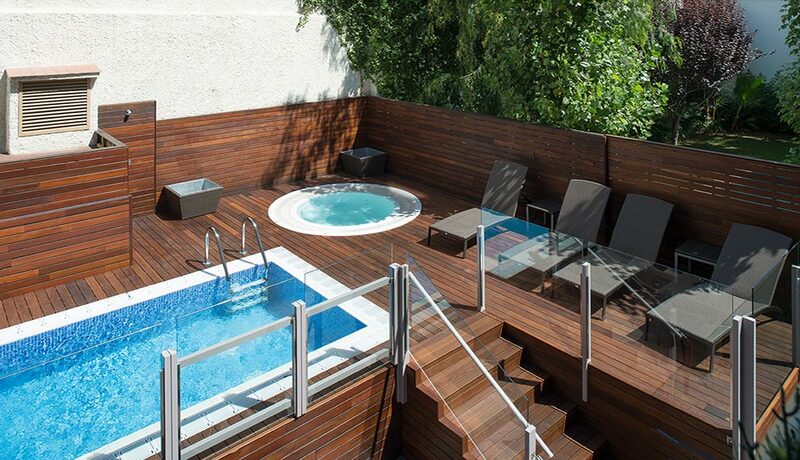 El Jardí de l’Àngel is a charmingly refreshing interior garden covering 600 m2. 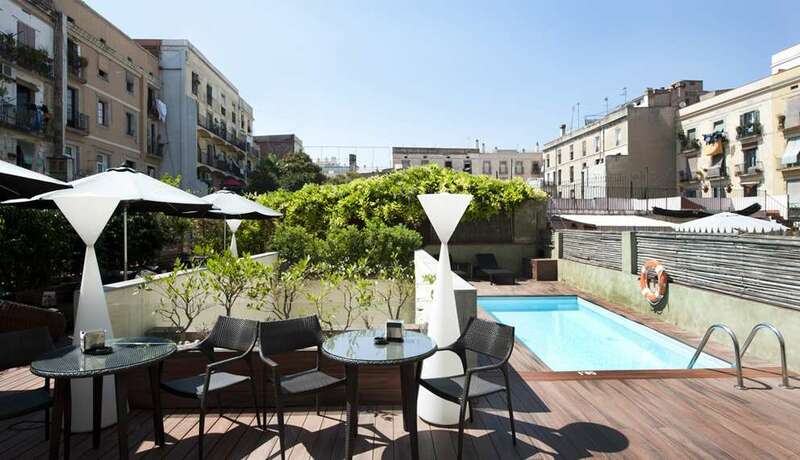 It is entirely in the open air and located in the centre of Barcelona. 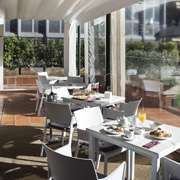 This lavish place is divided into two main areas: the glass-covered, heated pergola, in which breakfast is served, and the terraced area, decorated entirely in wood and gardened with all kinds of plants and palm trees. 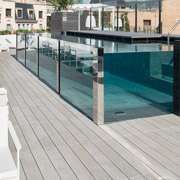 It has designer tables protected from the sun by sunshades and a beautiful swimmingpool that completes the sensation of relaxation in the garden. 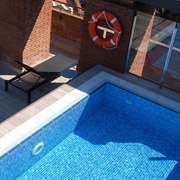 This charming hotel close to the Feria de Barcelona exhibition venue at Plaça d’Espanya has a rooftop pool where you can enjoy a dip and relax in an oasis in the heart of the city. 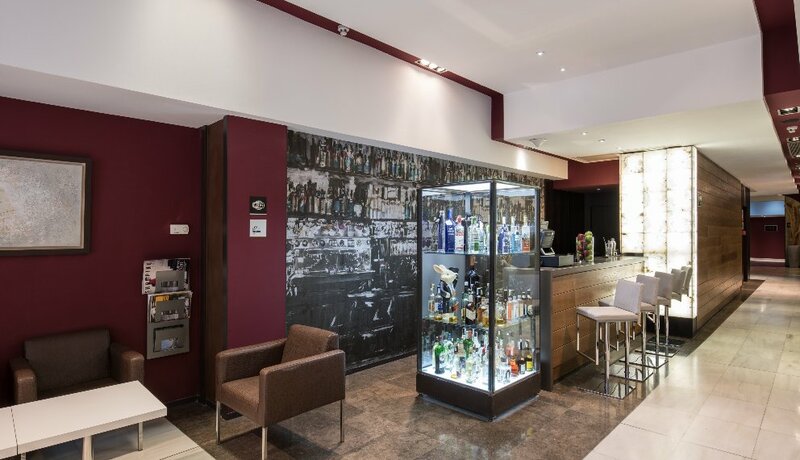 Because after a day of sightseeing or doing business you deserve a reward. 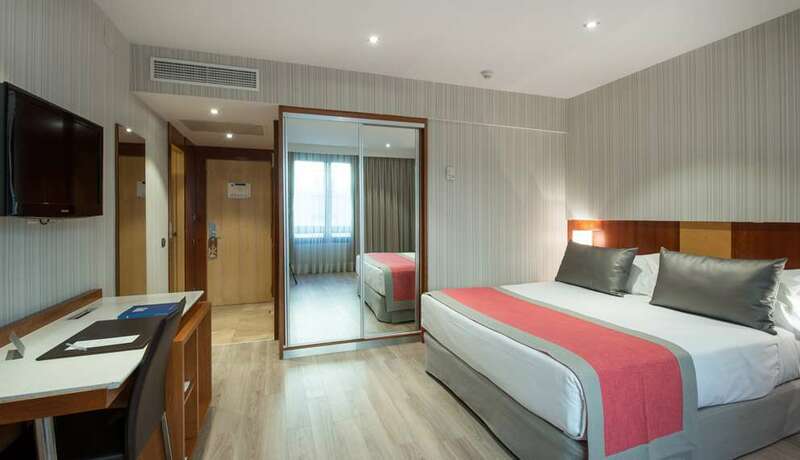 The Catalonia Roma is very comfortable if you’re here on business because it’s close to Sants train station, with the high-speed train, and the Feria de Barcelona exhibition venue. If you’re in town for leisure it’s also a good option if you want to take the high-speed train to another city. 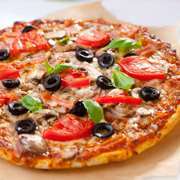 If you don't feel like leaving your room, you can order room service and wind down for as long as you need to. 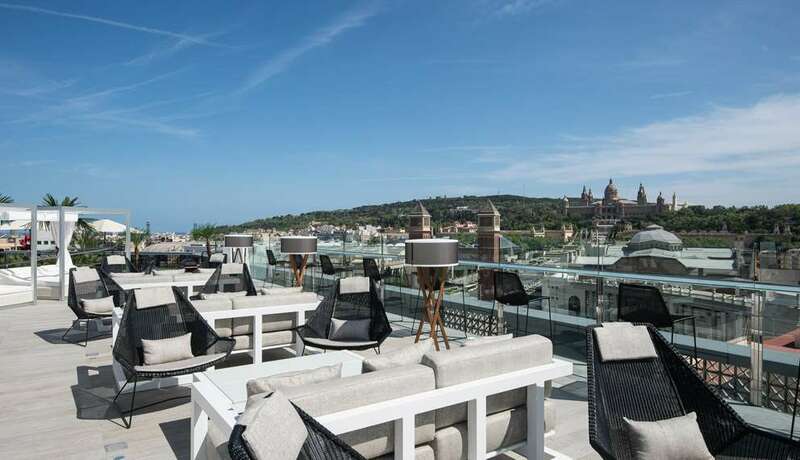 Plaça d’Espanya is also home to the Arenas de Barcelona shopping centre, Montjuïc mountain and the CaixaForum museum, formerly a major yarn and fabric factory designed in 1909 by renowned modernist architect Josep Puig i Cadafalch. 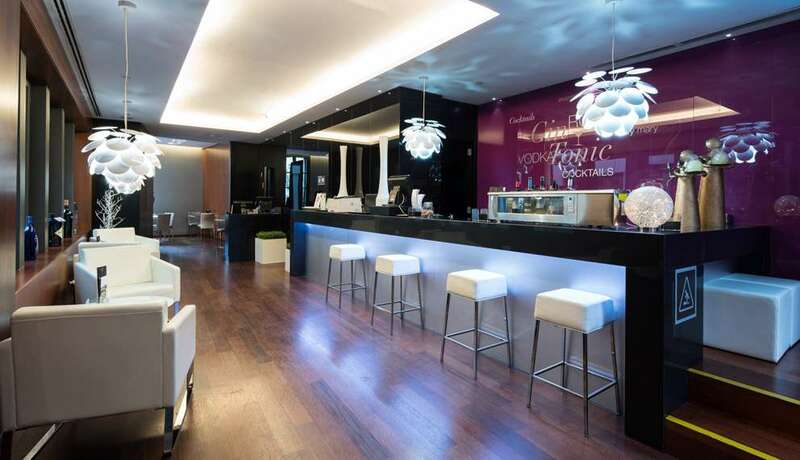 Stay at this hotel and experience the best of Barcelona! 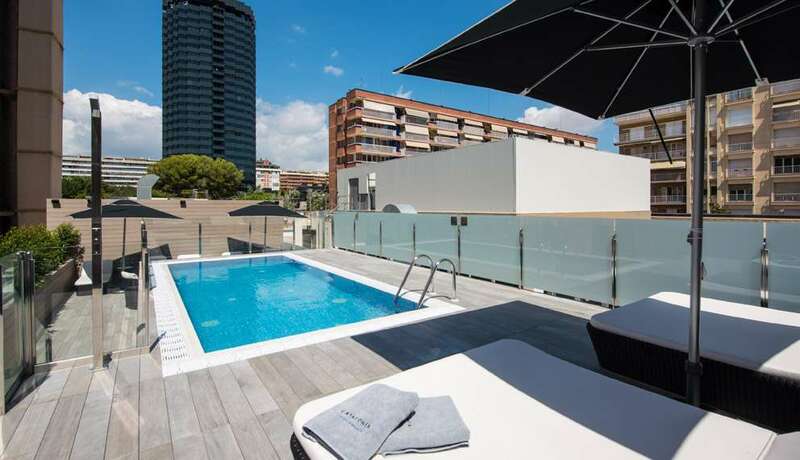 Discover Barcelona staying at this 3-star hotel conveniently located close to the Sagrada Familia and city centre where, in addition to comfy rooms with free wifi throughout, you can also enjoy the rooftop pool for relaxing in before or after your day of sightseeing. 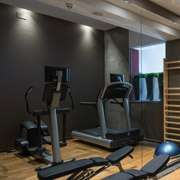 If you want to stay in shape on your trip, the Catalonia Sagrada Familia has a free gym for all guests. 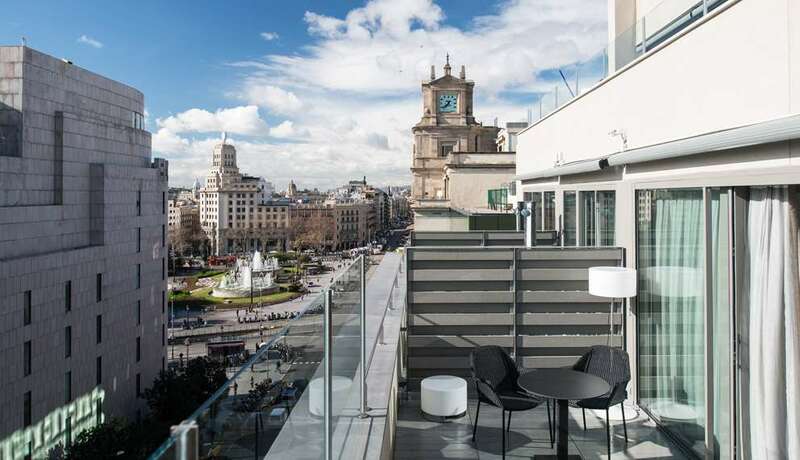 Take time to discover one of the most popular neighbourhoods in Spain, home to the impressive Sagrada Familia and Recinte Modernista del Hospital de Sant Pau, which connects to Avinguda Gaudí that boasts modernist details like the street lamps. 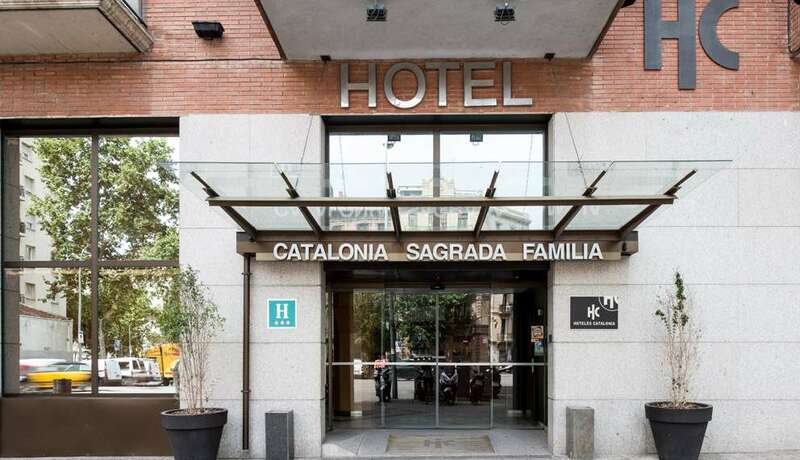 If you stay at the Catalonia Sagrada Familia and plan to visit the church, book your tickets online in advance to avoid long queues to get in, as the Sagrada Familia is one of the most popular landmarks in Spain. 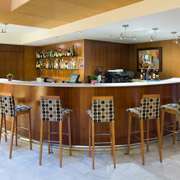 Fancy a break after a busy morning? 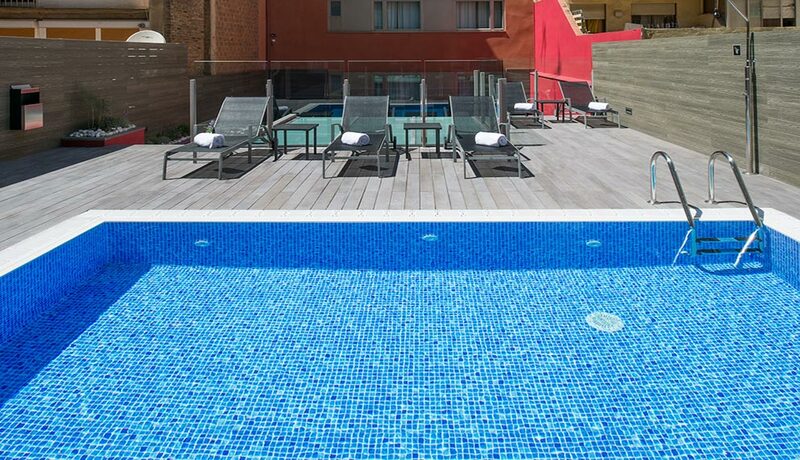 Come back to the hotel and enjoy a well-earned dip and then take it easy on the hammocks beside the pool, soaking up the sunshine while you decide what to do in the afternoon. 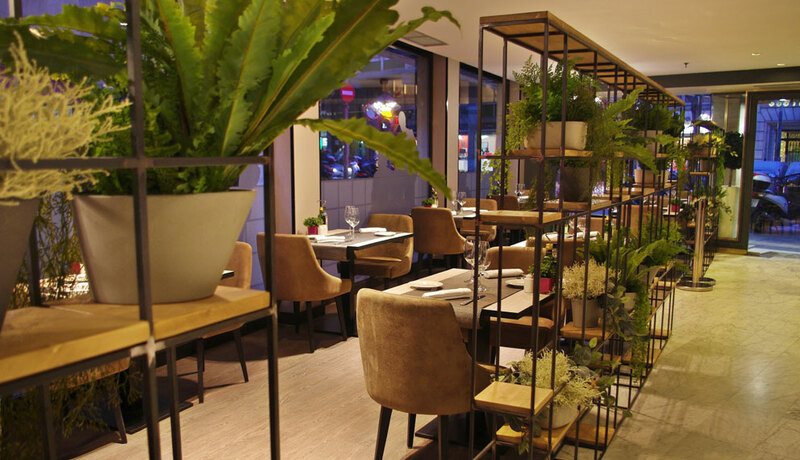 If you fancy trying the local cuisine, this popular neighbourhood is packed with tapas bars and restaurants, as well as souvenir shops where you can pick up a memento of your trip. What are you waiting for? 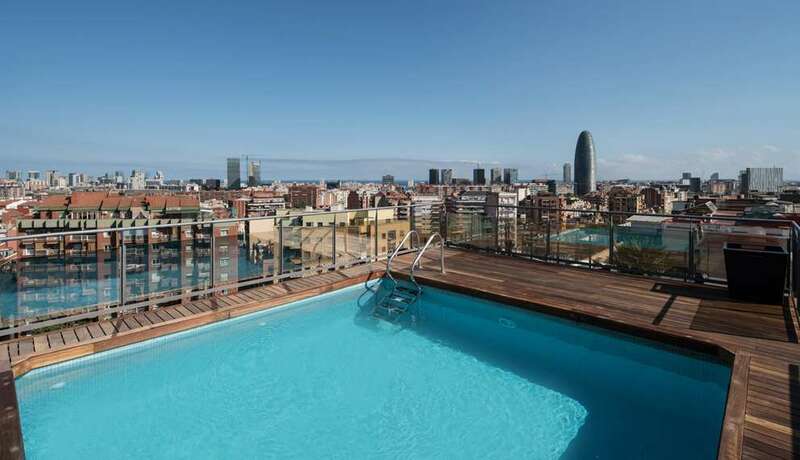 Join the Barcelona experience and discover the many wonderful places it has to discover! 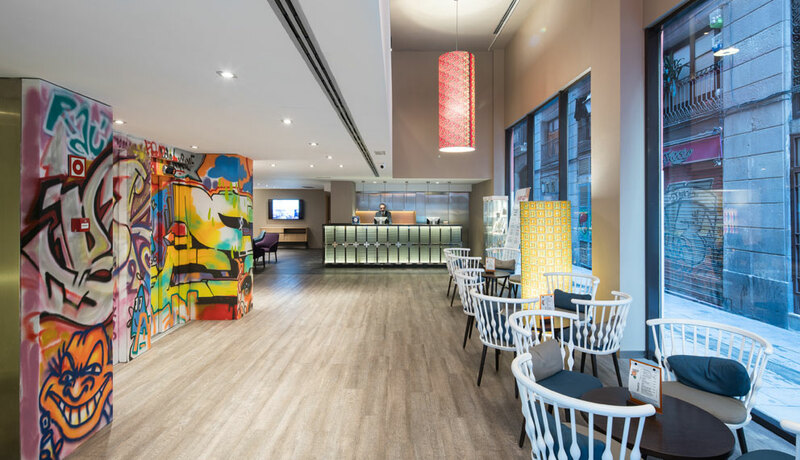 Opened in 2014, the hotel is at the heart of the city, right in the middle of Barcelona's historical and commercial district just next to Plaza Catalunya and Paseo de Gracia. 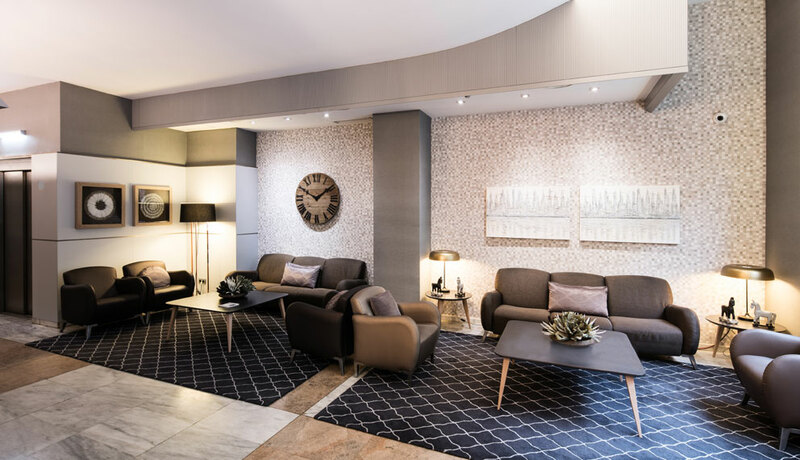 Its privileged location enables guests to go sightseeing to the city's major attractions and to go shopping to both popular stores and luxury outlets on Paseo de Gracia. 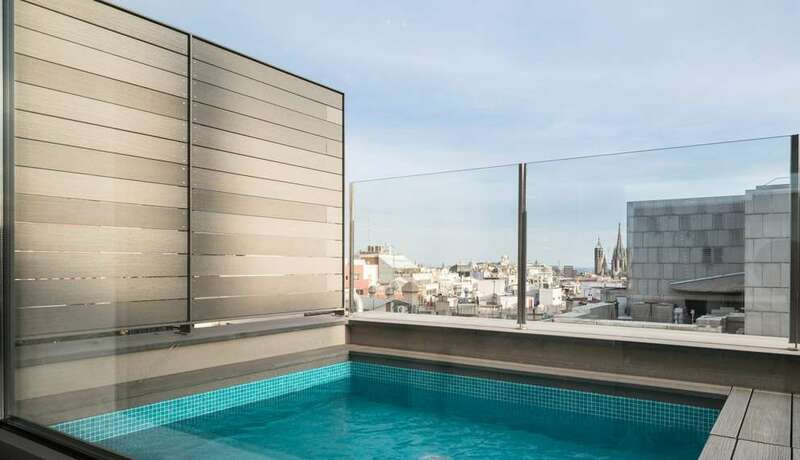 The Gothic Quarter, the Cathedral, Las Ramblas, La Pedrera and Casa Batlló are all just a stone's throw away. 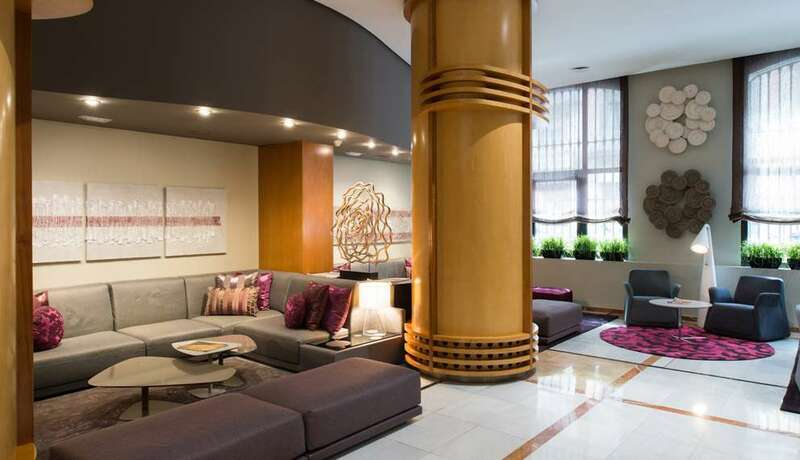 With its modern décor, the hotel seeks to make its guests feel at home in a chic cosmopolitan setting. 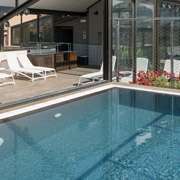 In the middle of the hustle and bustle of the city, guests can seek refuge on the terrace and enjoy the pool and solarium. 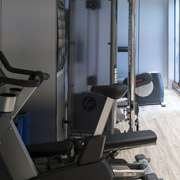 The hotel also has its own gym and car park. 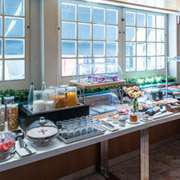 A full buffet breakfast is available and there is a gourmet corner for lunch and dinner. 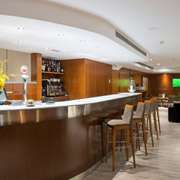 There is a bar on the first floor with a TV screen where guests can watch the best sports events. 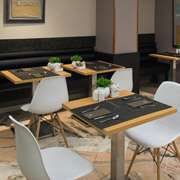 There is an Internet corner and a free Wi-Fi connection throughout the hotel. 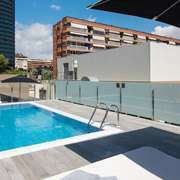 Its 58 modern, practical and comfortable rooms are divided into various categories, some of which have a furnished terrace and a private hot tub so that guests can make the most of their stay in Barcelona as best suits them.